These tips can save you both time and money. Let us help you through the process of finding a car that is right for you. 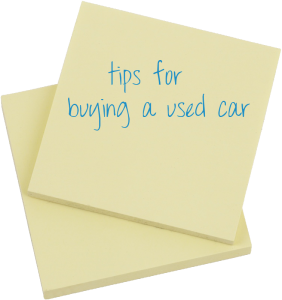 Buying a used car can be a save you money. Not only is the price of a used car lower, compared to a new car, but the ownership expenses such as collision insurance and taxes are lower also. Vehicles years ago were a risk to buy. Now, since the used vehicles you buy are so well maintained, there is less risk and greater reliability. With a certified pre-owned car, you can expect to get to Just like a new vehicle, with the certified pre-owned, you can expect the same standard in excellence. Each vehicle is less than six years old, under 80,000 miles, has a 12 month/12,000 mile Certified Limited Warranty, passed a 150-point inspection, and is covered by a Roadside Assistance program. Finding the right car is easier than ever. With our online tools and helpful staff, you can easily find your car online or let us help you find that perfect car. Make sure you test-drive your car. This can be the deciding factor. 5. Show me the Car Fax! Car Fax makes the buying process of a used car much easier. You can rest assured that the car that you purchase has no hidden problems. You know everything up front and there are no surprises. See what your current vehicle is worth. Click here to see what your current car is worth to put towards a new vehicle. Our professional financing department helps customers secure a car loan in the Montgomery area, or find a customized new car lease option. We can even help Alabama residents with less than perfect credit get an auto loan. Fill out our financing contact form below if you would like to have us get in touch with you to answer any financing questions. Apply online right now using our online finance application. You can also call us at (334) 271-2500, or stop by our Honda dealership at 2840 Eastern Blvd, Montgomery, AL 36116 to speak to an experienced new and used car loan professional today! Interested in a new or used Honda in the Montgomery area? Fill out the form below and we'll send you an Internet Price Quote.